The track up to the viewpoint is really frosty. Our area to clear is on the right behind the gorse. We had another day out to clear behind the gorse hedging to create an open space for the adders to sun themselves in the summer. This was the first hard frost of the winter and was such a relief after the non-stop days of continual rain. We had an on-going joke all day which finally wore us out! - Why can't the viper viper her nose - cos the adder adder handkerchief - got it? The clearing will now be flooded with sunshine in the spring and should encourage the adders. It was mostly gorse and very large bramble. We saw a group of Crossbills in the trees by the car park. 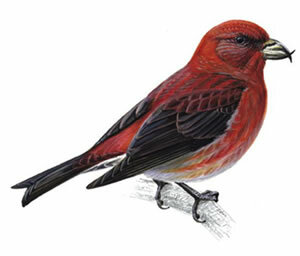 The birdwatchers on our team got quite excited as they are sure they saw a two barred Crossbill which is really rare. The last one to be seen in the Forest of Dean was eight years ago. A chunky finch with a large head and bill which is crossed over at the tips. Most often encountered in noisy family groups or larger flocks, usually flying close to treetop height. It feeds acrobatically, fluttering from cone to cone. Adult males are a distinctive brick-red and females greenish-brown. They are an irruptive species and may be numerous and widespread in some years, less so in others. Established breeding areas include the Scottish Highlands, the North Norfolk coast, Breckland, the New Forest and the Forest of Dean. It regularly comes down to pools to drink.